When Geets get snooty and you have to pull out the irresistable. The Tarancha-crab in size 6/0. 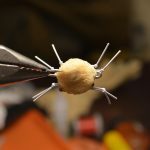 If you have ever attempted to the tie the Alphlexo Crab, without a doubt you have run into some frustrating moments with the process. 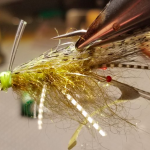 Whether it is managing the mess body tubing or threading the legs, this piece will hopefully help ease the pain with this non-traditional fly. Now there are many versions and ideas out there, I am going to stick to the original style which roots from the Alphonse Fishing Company guide team in the Seychelles. 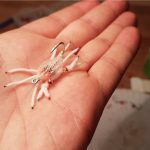 Starting with the body, which I might include is the only true portion of this fly using thread, there are some very helpful tricks which I came across when tying hundreds of these during our seasons in the Seychelles. 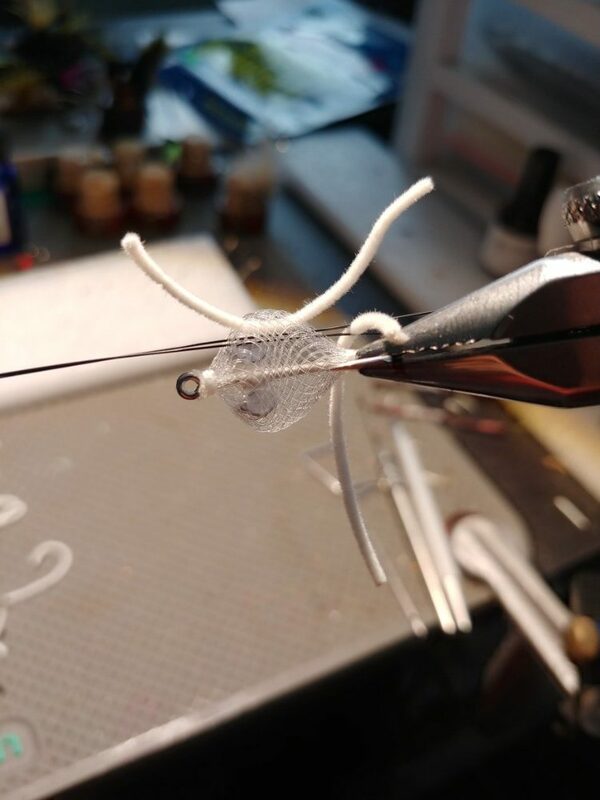 When starting with your thread, make sure that you are laying a solid foundation of it just behind the eye of the hook and right at the bend of the hook, where you will later be tying off the body tubing. What this will accomplish is a great place for you glue to bond together with the materials, as they will later be under more pressure that a typical flies’ dressing due to the nature of the body material. Tie in the desired weighted barbells as you please, this is one area where I have seen lots of different placement and I will say it’s in the eye of the beholder. When I introduced the idea of adding the hot orange bead chain next to the barbell eyes, this was due to the turbid water that we were targeting permit during our spring high tides, where the water was moving so fast that the sand was flowing with the current making for a less clear watered situation. We needed to get the fish’s attention and wanted just a bit more weight without going overboard of the plop factor. Now in saying this it has seemed to be working all the other scenarios too, but in the same token we fish plenty of them without adding this additional trigger point. 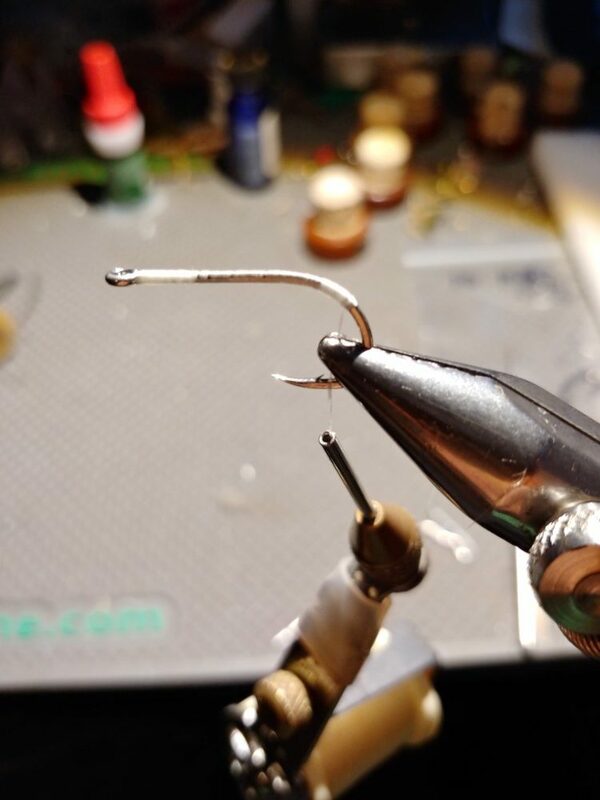 Now you are at the back of the hook where you have made a second thread dam, make sure that your hanging thread is now not at the very back of the hook. I like to have it just in front of the thread dam so that when I slide the body tubing over the hook, that when I go to secure it down it doesn’t slide off the material. That process will only make sense to those who have suffered through this portion of the fly. As far as the length of tubing I working with, to make life easier I use about one foot at a time, this way you are getting as much wastage with cuts and if you need to re-trim the end of it you aren’t of your length requirements. Now when you slide the tubing over the hook, pinch off the back end (bend side of the hook) and don’t let go. 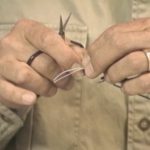 While pinch you are now going to give 5 solid wraps of thread, take a look under fingers if you need to adjust the placement of anything, and then finish up by covering as much of the cut ends up with your thread. At this point you are done back there but need to tie off and there is a bunch of tube in your way, making a whip finish impossible. While holding pressure to your thread apply some glue to those thread wraps, wait 5 seconds, and cut the thread. That thread dam will have absorbed the glue through the body and is now pretty bullet proof. This next step is one of the more tricky spots that once you master will make the process way easier down the road. First, wrap some thread around your index finger of your vise hand (hand on the vise side, not the thread wrapping hand). 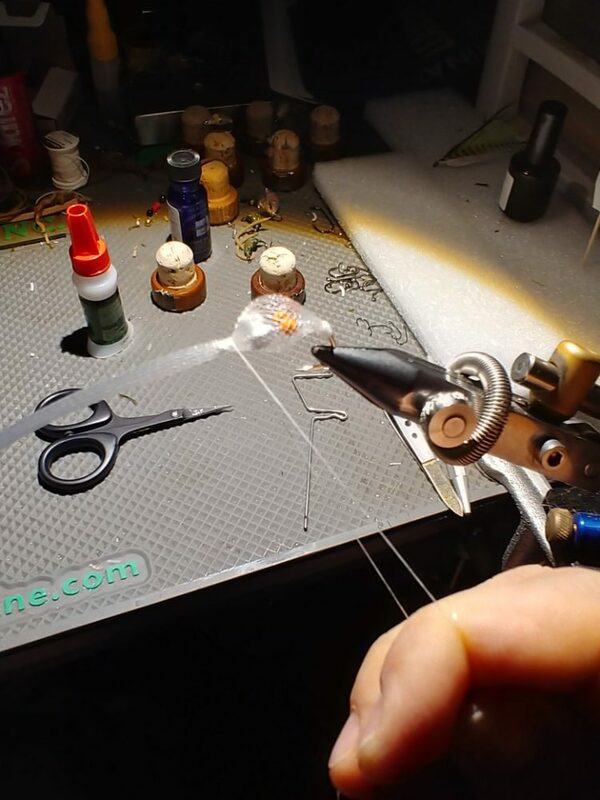 Make two wraps around the body tubing directly over the eye of the hook and hold bobbin with your vise hand. Your wrapping hand now will push the body tubing towards the back of the hook until you have reached your desired body size. Now pull the thread tight while your wrapping hand is pinching the thread wraps so they don’t slide back down the tubing. At this point you can pass your bobbin back over to your wrapping hand to make 5 more tight turns. This should now keep you in place to where you can shape your body better by pinching both sides of it to flattened as much as possible to the hook shank. The flatter the better! Snip off your remaining tubing in front of the eye of the hook and whip finish your thread. Clean up your head using a side cutter like you would see advertised as a toe nail clipper, and apply glue after that. By gluing after you cut, the tubing isn’t as rock hard to work with, saving the life of your cutters. 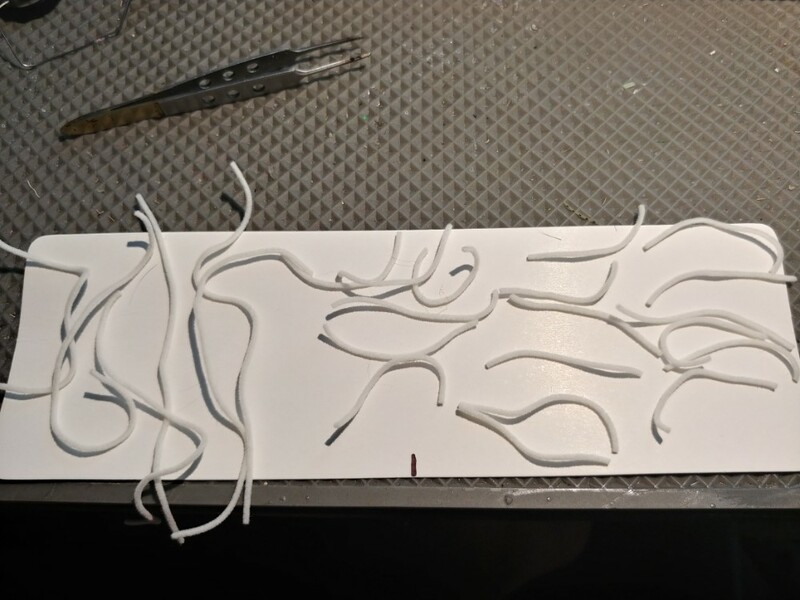 Making up a bunch of bodies at one time will speed your process up and eliminate a bunch of different piles of components on your desk, and the next portion of the flies is like building a model where you will need some space to prepare everything needed. I like tying these flies in groups of 6, it should only take about an hour all said and done. Find your desired chenille, in my case I use Ultra Chenille size micro (1mm). Cut 18 legs and put them in a pile, they should be all the same size at this point, and they will later be trimmed. Make yourself a mark on your tying desk or on a piece of card board to reference how long your cut needs to be for your claws. Having this the same size every time will streamline the process and in the end your will having the same proportions every time! Take the time to make up your six sets of claws using a pair of thin nosed tweezers to create the knots. 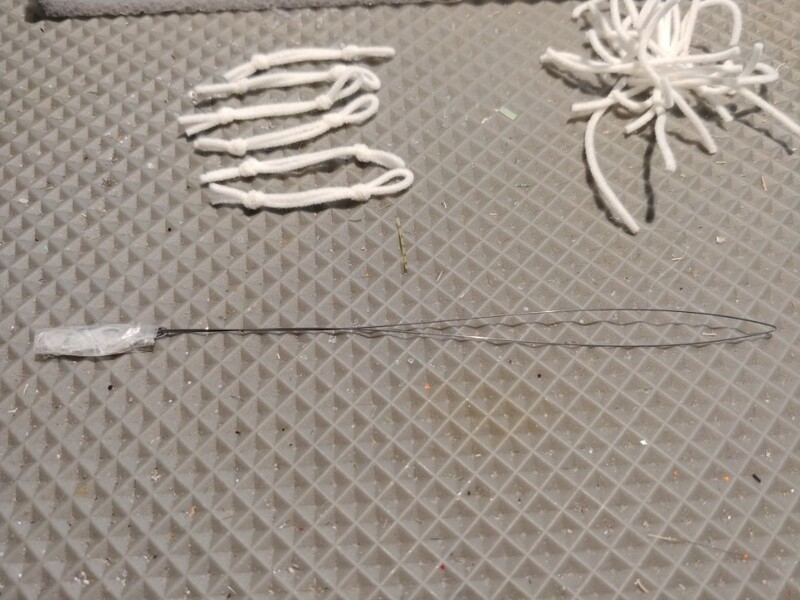 Before I tighten my second knot, I gauge it next to one of the crab bodies to find my perfect spacing. I will then use this as a reference for the remaining sets of claws as I tighten the knots. Make up six sets of eyes, my personal preference is burning then coloring the mono, as most UV glues are useless in the saltwater and epoxy is just a mess. Keep the shanks of the mono long and cut at an angle so that they find the hole in the mesh body that much easier. 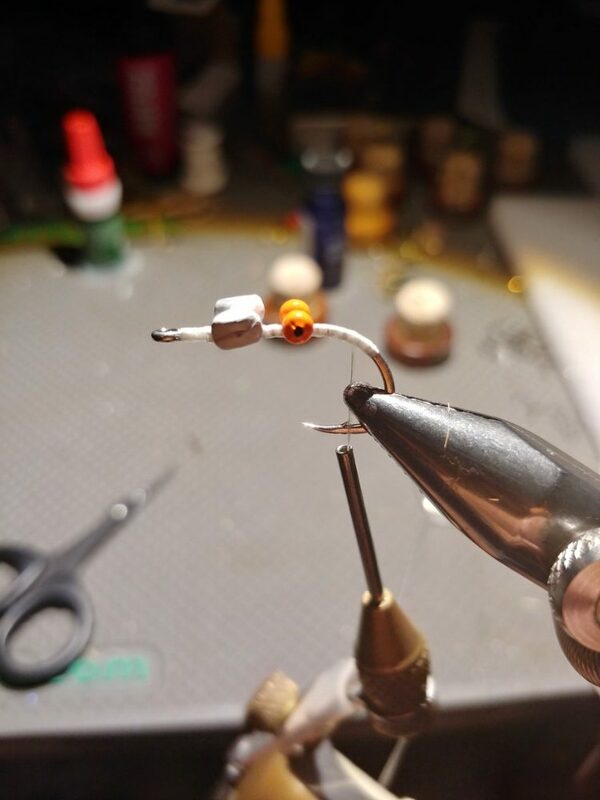 Using a piece of thin wire, like that used as a bite guard for barracuda, create a bobbin threader by doubling a long piece over and pinching the bend of it tight. This will make for easy leg and claw insertion without compromising your actual bobbin threader. Leg placement is key to the success of this fly swimming with the hook point up and this was a long process in figuring out what was the cause of this issue. 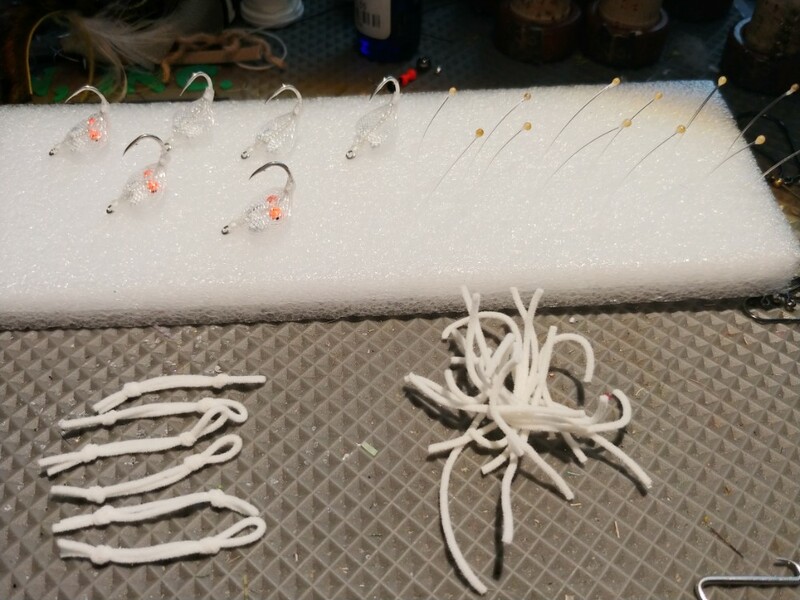 Essentially the legs are going to act as a wing of sorts like you would see on clouser, where it will be the material that has more buoyancy helping the fly stay righted. 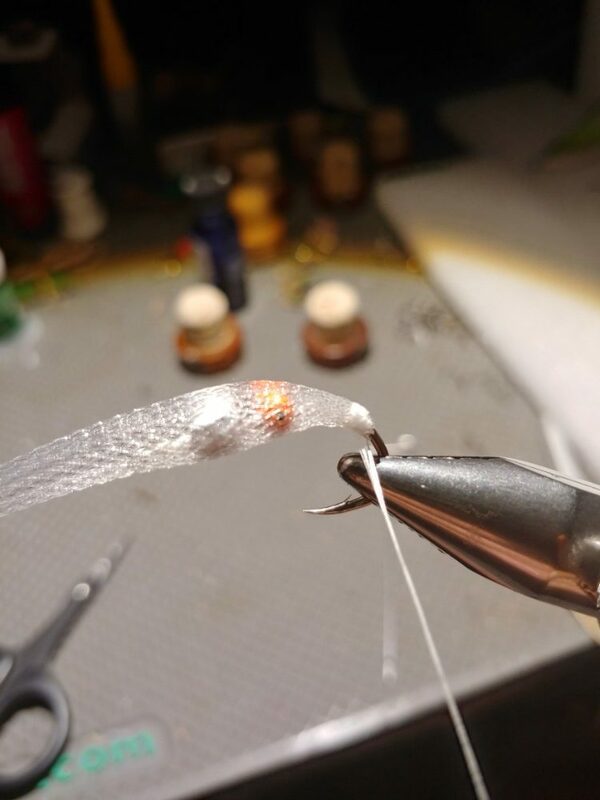 If you have tied this fly with the legs on the belly, which seems like the natural approach, you will have a crab that swims upside down 100 percent of the time. 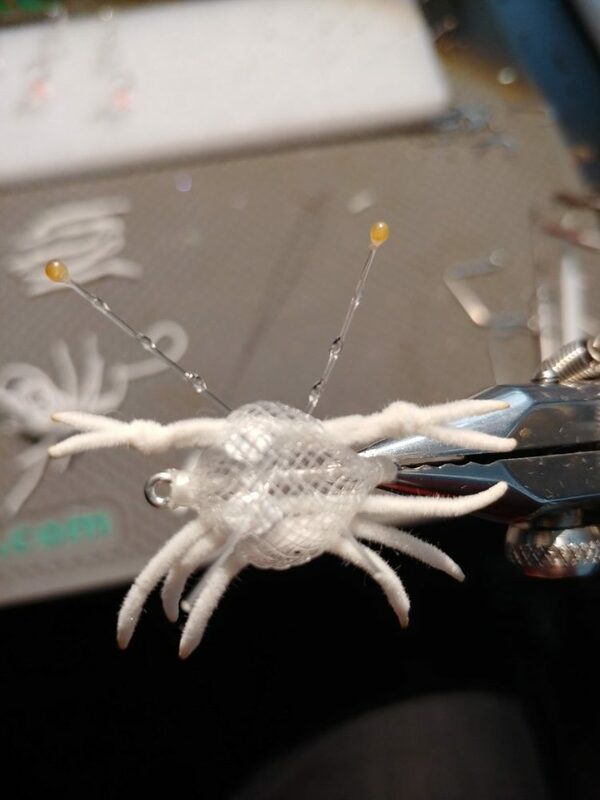 So without making the crab to strange, slide the bobbin threader that you made through the edge of the crab where the top meets the bottom of the body. As you start pushing the threader through, guide it over the barbell so that when the leg goes through it will be on top of this weight. Repeat this step two more times; ensuring there is a even spacing of legs and they continue to go on top of the weight. The claws in my opinion need to have some length as this is the strongest attribute of a crab that a fish will pay attention to. 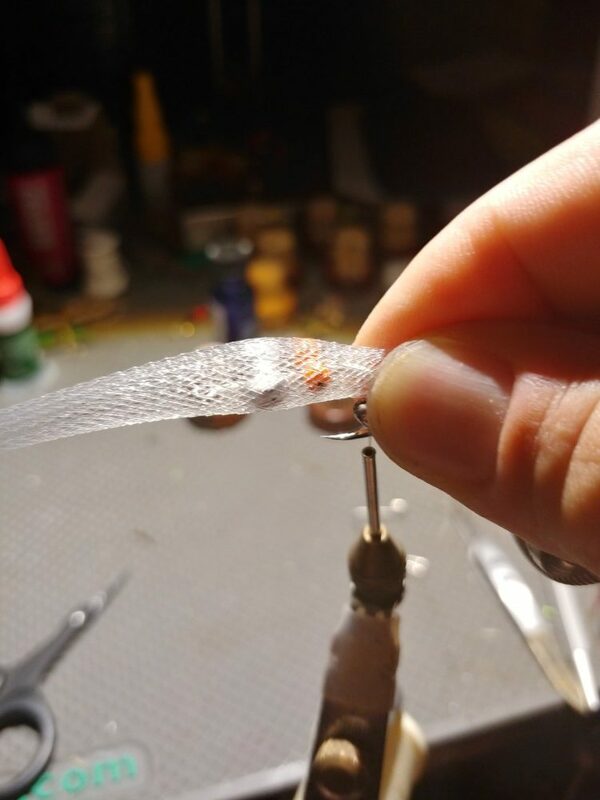 I keep a couple mm’s on each side outside the body as opposed to the knots butting right up to the body, so that they will flex with each strip of the fly. Threading the claws is a bit of a pain, just make sure that you hold onto on side as you come through so you don’t pull them all the way through and have to start over. 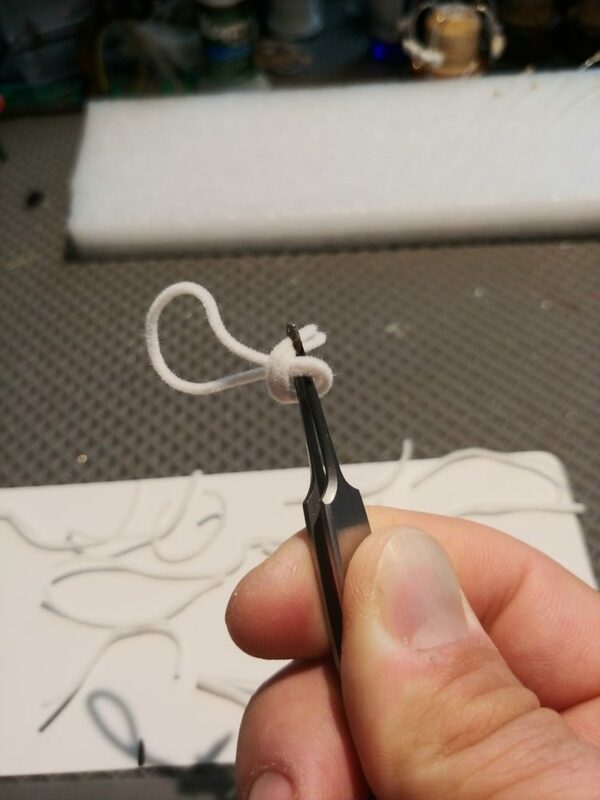 Once in the body, even them out and glue the whole arm on the side of the hook point and only a touch of glue for the one closer to the eye of the hook. As a crab naturally flees it will keep the back claw straightened, while the front one is going to help make headway with swimming. 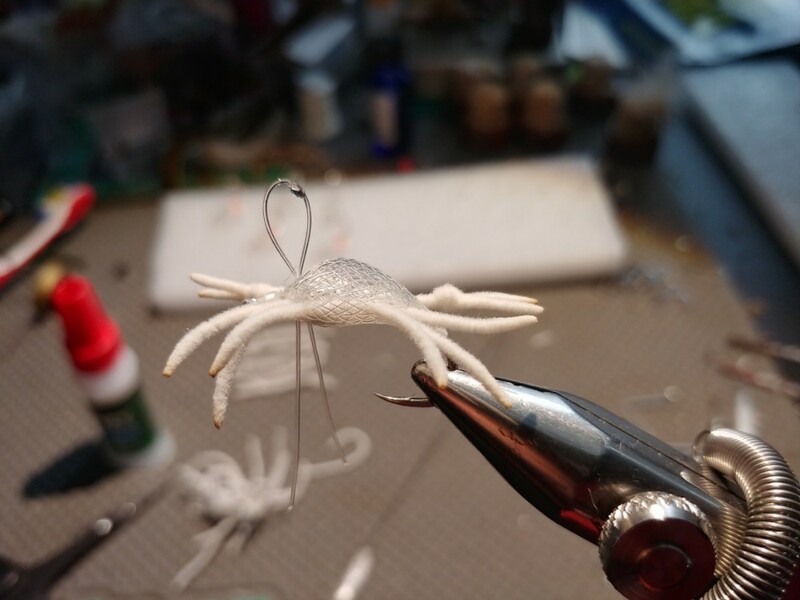 Trim out the legs to the size of your liking, too long and your crab will look like spaghetti in the water! I only touch the legs right at the body with glue as well, so that they have maximum amount of movement. Burn the tips of the legs with just a quick touch of the flame, they can really go up in flames of your aren’t quick. When placing the eyes it is very important that they find a good home where they shanks will have something to bond to with glue. 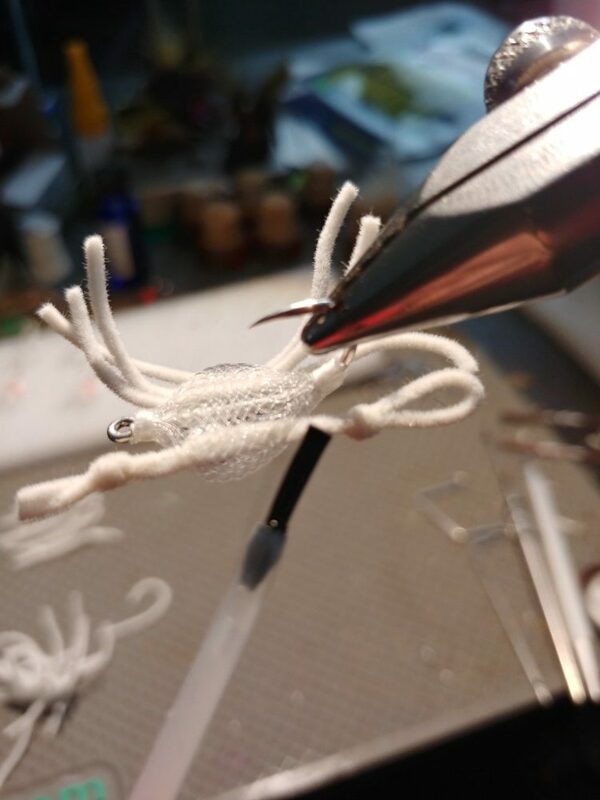 I pass the eye shanks directly through my claw chenille with glue so that they are surrounded by a soft bonding structure. Keep your spacing of the eyes fairly wide, like next to the claw arms, otherwise you will have a cross-eyed looking crab! Lastly you will be adding a weed guard because a saltwater crab to me is useless without one. Always remember you can cut it off! Find a lighter piece of hard mono that you can pass through the body and that isn’t going to hinder a hookup by being too rigid. 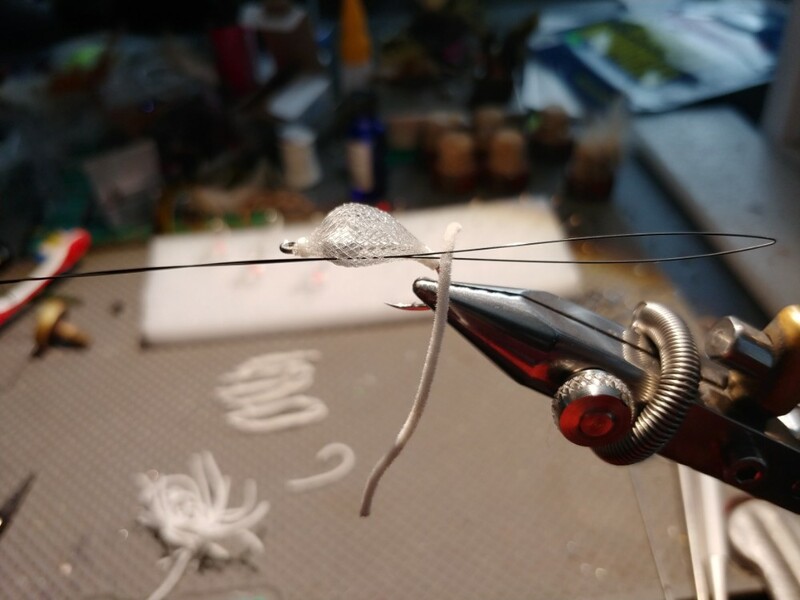 Push this piece through on the belly of the fly, on either side of the hook shank, up through the top of the fly. before bringing it all the way, apply a drop of glue right on the bend, and then seat it nicely into the body tubing. Trim the mono so that it is just higher than the hook point no more than 1 mm. Hey Kyle! Thanks for the message and link. Yip, flexo as a material is not new, neither is the concept of flexo as a crab body. No doubt the original Flexo Crab is a great fly, but having fished both variations of the fly in the Indian Ocean, the Alphlexo is definitely an improvement on the original, at least for our conditions and fish! The guides in the Seychelles – including Alec – have put hundreds of hours into improving the subtleties many of the flies we know and love!